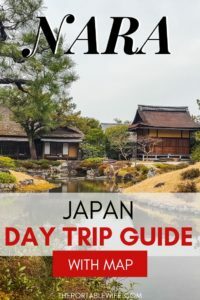 When people ask me about the must see places in Japan, I always recommend a Nara day trip. With eight UNESCO World Heritage sites, roaming deer, and a stunning Japanese garden, you won’t regret spending one day in Nara! 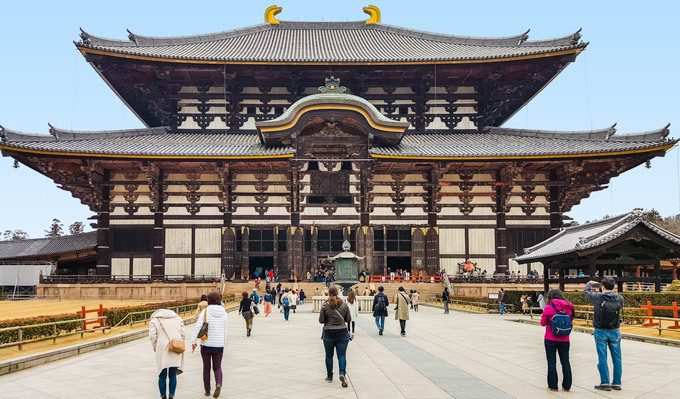 Once an ancient capital of Japan, Nara is home to some of the country’s most important cultural places, including the world’s largest wooden structure. 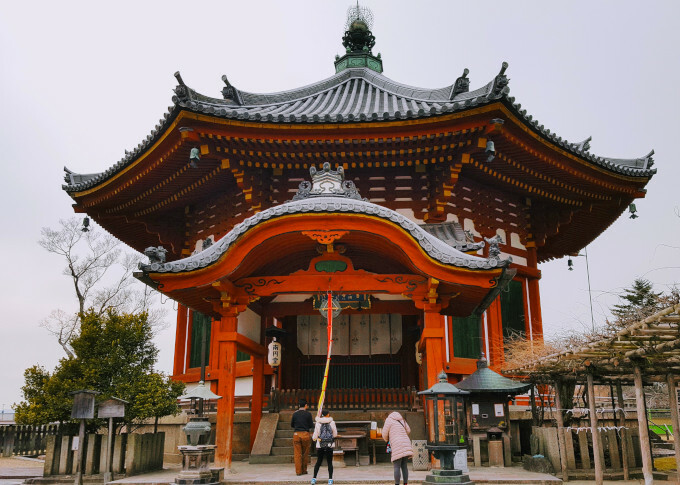 Buddhist temples and Shinto shrines dot the landscape, and sacred deer wander the city’s green spaces. Taking a Nara day trip feels like stepping back through time. 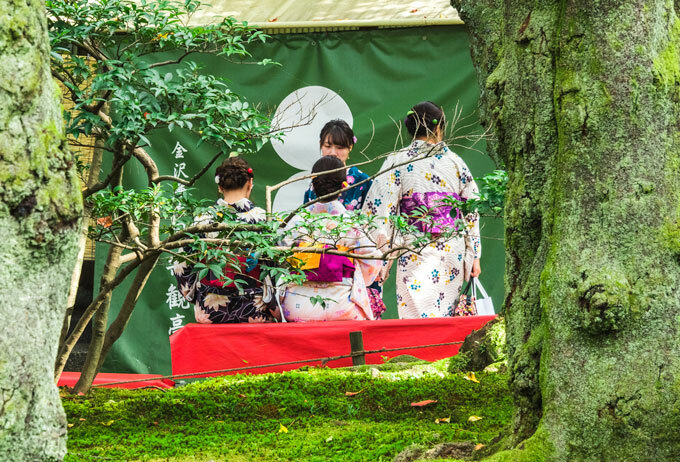 In fact, many Japanese travelers wear traditional yukata as they explore the city. Luckily, modern conveniences like the Shinkansen bullet train make it possible to see Nara in one day! Visitors coming from Kyoto or Osaka will have the most time to spend in the city, but it’s also possible to do a short day trip from Tokyo. There are two train operators for lines running between Kyoto and Nara: JR West and Kintetsu Railways. Japan Rail Pass holders can take the JR Nara line from Kyoto Station to JR Nara station. Local lines run about three times an hour, and the journey takes about 70 minutes. There are also the Miyakoji Kaisoku express trains that travel from Kyoto to Nara in 45 minutes. However, they don’t start running until after 9:30am. You could take the first rapid line service from Kyoto to Nara station and arrive by 10:20am. However, for this 1 day Nara itinerary, you’ll want to arrive in Nara no later than 9:30am. Otherwise, you will need to cut your trip short. There are several Kintetsu train options from Kyoto Station to Kintetsu-Nara Station. The fastest option is the Kintetsu-Limited Express, which runs twice an hour and takes 35 minutes. However, you must have a seat reservation for Limited Express trains, so you need to buy a ticket at the machine or counter beforehand (no using an IC card). Alternatively, the Kintetsu-Kyoto local line takes 45 minutes, with some trains running directly to Nara. You’ll need to take care when traveling on the Kintetsu lines, as some trains require a transfer at Yamato-Saidaiji Station before continuing on to the Nara line. Here are some very detailed instructions on how to use the Kintetsu machines to purchase tickets. Regardless of which train operator you choose, you can get to the heart of Nara Park from Kyoto in just over an hour. You’ll have plenty of time for exploring Nara in one day. 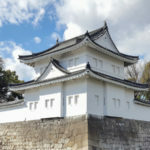 Osaka may seem far away, but you can get from Osaka to Nara in under an hour by train! The fastest and easiest way is to take the JR Yamatoji Rapid Service from Osaka Station. It departs roughly three times an hour and takes about 55 minutes to reach JR Nara station. 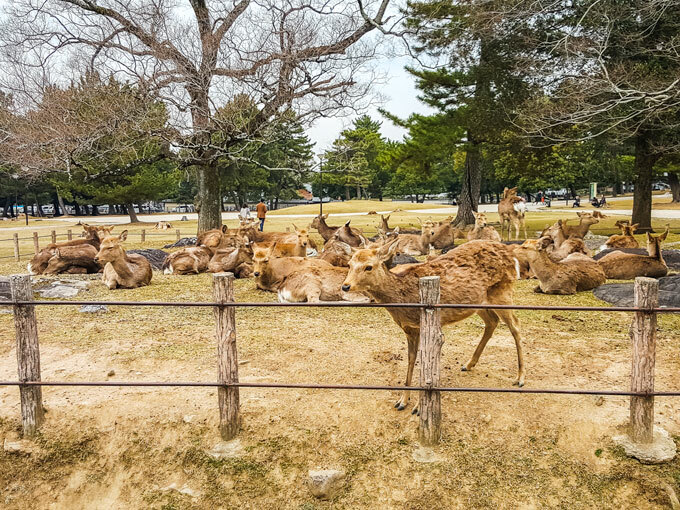 This quick travel time makes spending one day in Nara a no-brainer if you’re based in Osaka. If you’re determined to do a Nara day trip but aren’t staying in the Kansai area, it’s possible to get here all the way from Tokyo. Take the Tokkaido-Sanyo Line shinkansen from either Tokyo Station or Shinagawa Station, all the way to Kyoto Station. The Kodama and Hikari trains (covered by JR pass) take about 2 hours and 40 minutes to go from Tokyo to Kyoto. From Kyoto Station, take either the JR Nara line or one of the Kintetsu lines as outlined in the Kyoto transit section above. After all the transit and walking, it would take nearly 4 hours to reach Nara Park from Tokyo. And at more than ￥13,000 per Shinkansen ticket, this would be one expensive day trip! Thus, I wouldn’t recommend it unless you have a JR Pass. This Nara day trip itinerary was designed to be completely walkable. However, should you need transportation, Nara is well-connected by public buses. If you’re following this guide and arrive at JR Nara station, you might make use of the red Gurutto bus. It runs from 9:00am-5:00pm and makes a circular route, with stops including Nara Park Prefectural Office and JR Nara Station. The fare is only ￥100, making it a cost-effective option for those who can’t/don’t want to walk to and from the JR station. Located a few minutes’ walk from Kintetsu-Nara station, Kōfuku-ji is one of eight structures that form the UNESCO Historic Monuments of Ancient Nara. Kōfuku-ji’s main temple was originally located in Kyoto, but it was taken apart and rebuilt in Nara when the city became Japan’s capital. The beautiful Buddhist temple grounds house seven buildings, including the iconic five-storied pagoda that’s visible in the Nara skyline. Visitors can enter the grounds for free, but it costs ￥800 for a ticket to the National Treasure Hall and Eastern Golden Hall. Isuien is one of my favorite gardens in Japan. 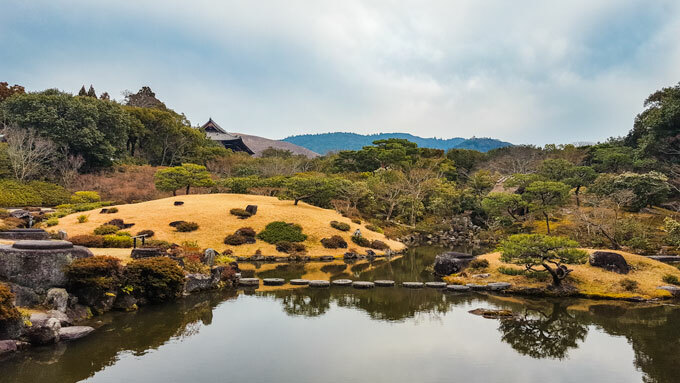 With reflecting ponds, a tea house, and gorgeous views of Mount Wakakusa, Isuien is a relaxing escape in the heart of the city. 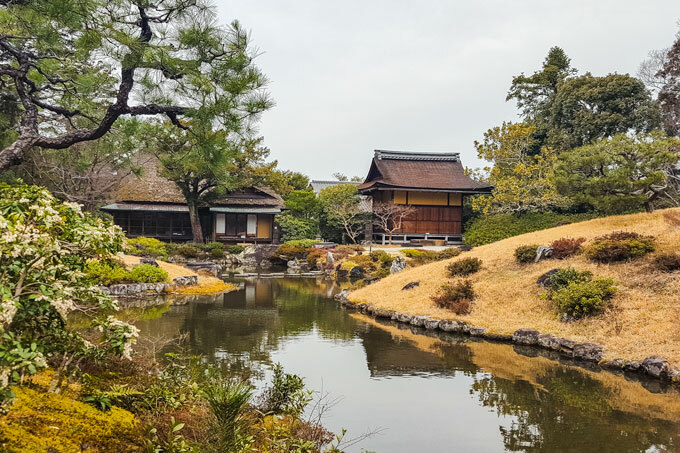 The garden is split into front and back sections, which were each designed in different historical periods (Edo and Meiji). Stepping stones and a water wheel add a charming touch, and always make me think of Studio Ghibli films. The ￥900 admission is money well spent, and includes access to the small pottery museum adjacent to the garden. Tōdai-ji is the architectural highlight of this one day Nara itinerary. Housing the world’s largest Daibutsu (bronze Buddha statue), the Great Buddha Hall is also the world’s largest wooden structure. Approaching Tōdai-ji is a surreal experience, as the sacred Nara deer freely roam the temple grounds. It’s also hard to believe that a 1,300-year-old building could be so large and well-preserved! Pay the ￥600 fee to enter the Great Buddha Hall (daibutsuden), where you’ll see the giant Buddha statue flanked by a golden Nyoirin-kannon statue. Take care not to disturb the people at prayer when you pass through the hall. As you walk through the daibutsuden,, don’t miss the wooden scale model that shows the original Tōdai-ji temple grounds, complete with two towering pagodas. 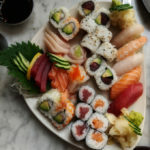 In the spirit of Japanese tradition, use your lunch time to try some local Japanese dishes you haven’t yet eaten on your trip. The Kansai region is best known for okonomiyaki, takoyaki, and tofu. 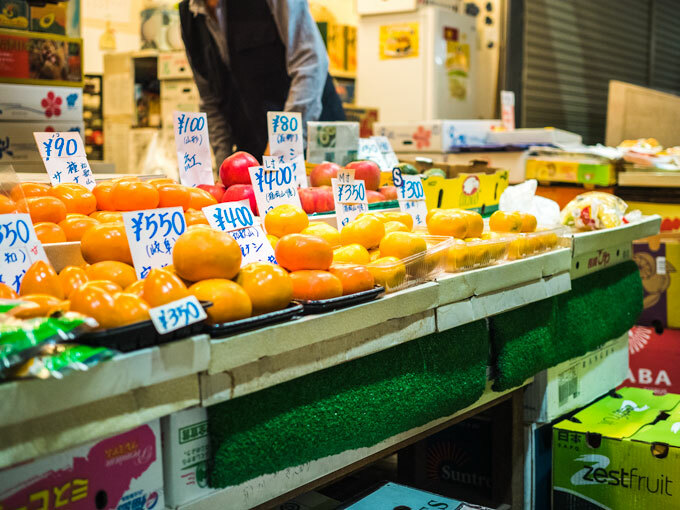 If you’re feeling budget-conscious, there’s nothing wrong with getting a cheap and tasty meal from the local Lawson, Family Mart, or 7-Eleven. If you were hoping for more deer encounters after Tōdai-ji, you’re in for a treat. 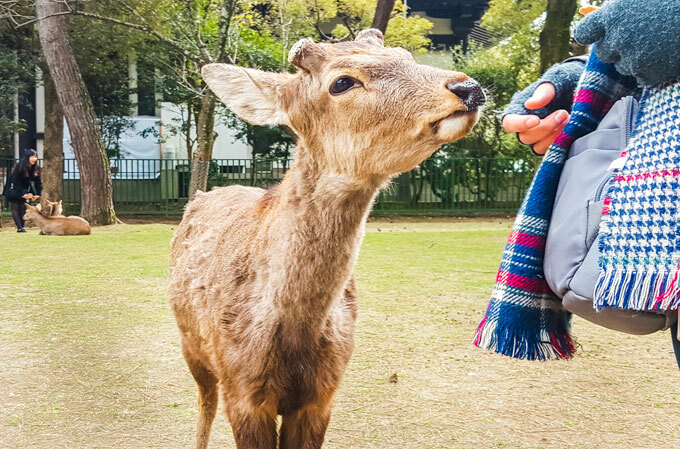 Nara Park is full of the city’s beloved animal residents, and they aren’t afraid to say hello! Licensed street vendors sell packages of biscuits that are specially formulated and controlled for the health of the deer. If you’re shy about animal encounters, do not buy the biscuits. As soon as a deer sees you holding one in your hand, it will follow you around until it gets a snack. I had a fun time watching tourists nervously offer biscuits to eager deer, dance away once a deer approached, and then get chased around the park until they finally dropped some treats on the ground. It should go without saying, but under no circumstances should you feed the deer anything but the special biscuits. It’s actually a crime to do so, or to mistreat the deer in any other way. Once you’ve finished off your pack of treats, head east on the path leading to Mount Wakakusa. It’s a fairly easy 40 minute walk to the mountain’s peak, where you can take in panoramic views of Nara. You’ll also pass more Nara deer as you make your way upward, which adds to the peaceful atmosphere. Rounding out the day’s shrine visits is Kasuga-Taisha, another one of Nara’s UNESCO Historic Monuments. Kasuga Grand Shrine is most famous for its thousands of stone and bronze lanterns that line the walkways and fill the corridors. The surrounding primeval forest makes visiting Kasuga-Taisha a truly magical experience that cannot be missed on a Nara day trip. And if you’re wondering what to do at Nara in the spring, the cherry blossoms lining the main walkway are a must see. 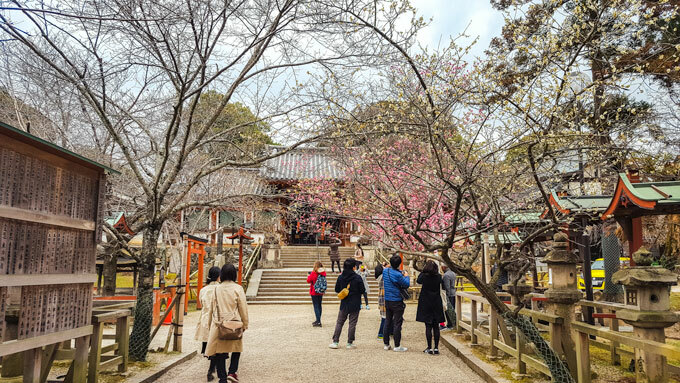 Admission to the temple grounds and main offering hall is free, while it’s ￥600 to walk the inner area and main sanctuary. If you’re fortunate to be here in February or August, you can witness the Man-Toro lantern lighting festivals. Want my exclusive travel savings guide? Sign up for my monthly newsletter and receive a FREE copy of my 7 Insanely Simple Strategies to Afford More Travel! I’m not much of a souvenir shopper, but I can’t resist a good Japanese shopping arcade. Whether you’re in the market for coin purses, origami paper, or mochi, Higashimuki has plenty of shops and restaurants to please everyone. Best of all, Higashimuki is only a short walk away from the Kintetsu-Nara station. You won’t have far to go if you do decide to splurge on a bag of Japanese goodies. 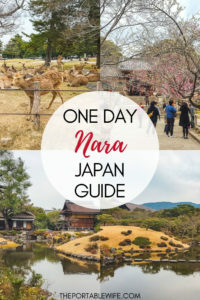 Have More Than One Day in Nara? Nara National Museum: Houses a number of permanent and rotating collections of Japanese National Treasures, artworks, and cultural artifacts, with English displays and audio guides available. Yakushi-ji Temple: Part of Nara’s UNESCO Heritage Monuments, this Buddhist temple is one of Japan’s oldest and has two beautiful three-story pagodas. Horyu-ji Temple: Located on the western side of Nara, Horyu-ji’s pagoda is said to be the world’s oldest wooden building. 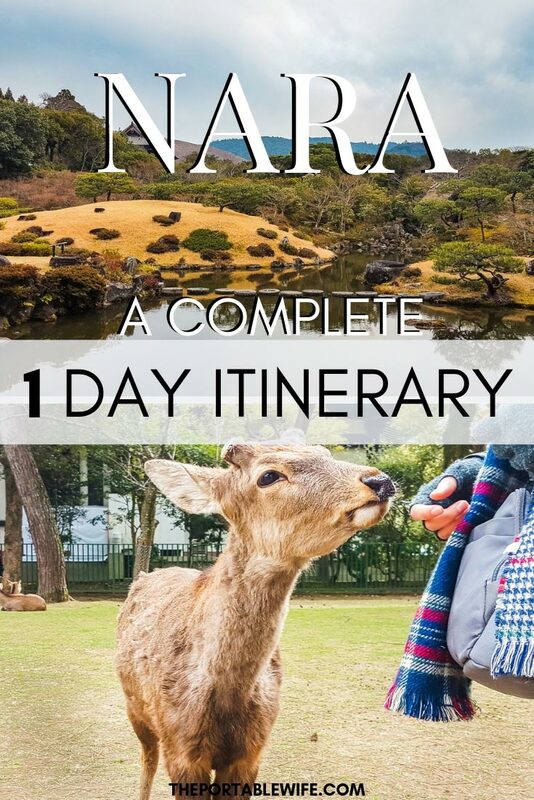 Have you spent 1 day in Nara? Is there anything you’d add to this list? Let me know in the comments section! Wow! This sounds like an incredible place! I must admit I’d never heard of it until now but I’d LOVE to meet those adorable deer. Definitely adding this to my must visit list! You won’t regret it! I only wish I had more than one day to spend in Nara last time I was in Japan. Hello there! I’m Chelsea, a.k.a. The Portable Wife. I’ve wanted to live abroad since I was a kid, and my dream came true in 2018 when my husband and I moved to London. Now, I share authentic advice on how to maximize your vacation days, grow your travel budget, and move abroad. Let my detail-oriented brain help you tackle your next adventure! 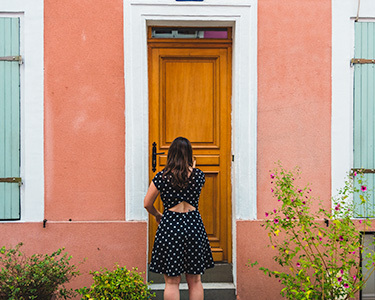 Get exclusive tips, travel inspiration, and expat musings delivered once a month to your inbox. Plus, get a FREE copy of my 7 Insanely Simple Strategies to Afford More Travel when you join!